About Alex came out in 2014 and is now on Netflix. Food, music, excess amounts of drugs and alcohol are just a few of the reasons a group of friends come together to reunite and reminisce about the past. But never did this group of friends think that they would be reunited because of an attempted suicide. “About Alex” is a movie on Netflix about a group of friends who are forced to come together to help a friend who has attempted to commit suicide, Alex. Through this reunion the friends unfold secrets, love affairs and regrets from the past. Although it is attempted suicide that brings the friends back together after many years, the weekend reunion doesn’t only bring them closer together, but also pushes them to their breaking points. The weekend reunion brings out clashing points of views, love triangles, lies and secrets, but these same things help the group of friends realize what it is that they are each missing in their lives. 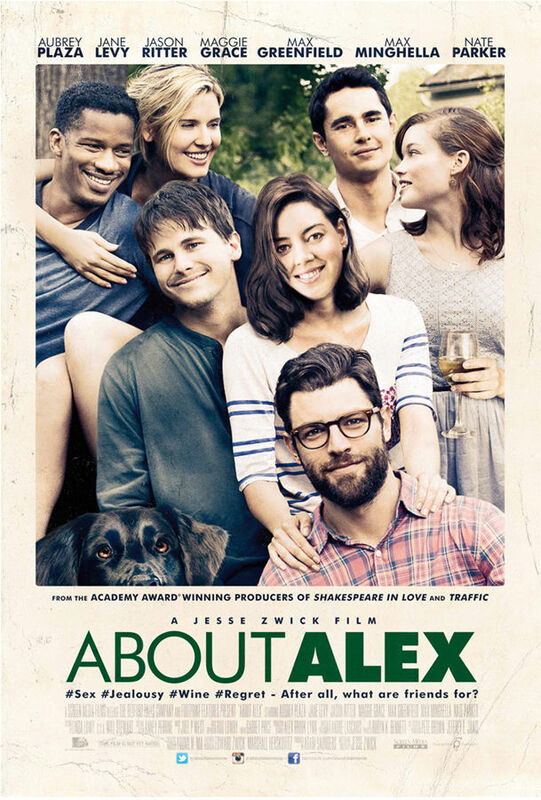 “About Alex” is funny, cute, sad and it keeps you on the edge of your seat; more importantly, it raises awareness about suicide. The only thing that I did not like about the film is that it was very predictable. But it doesn’t hurt that the cast is full of great, funny and talented actors including Nate Parker, Jason Ritter, Maggie Grace, Max Greenfield, Aubrey Plaza, Max Minghella and Jane Levy. The characters in the movie are played by actors who typically play funny, humble and goofy characters. It was interesting to see a few of these actors play a different role than they typically play. In “Parks and Rec,” she plays a super funny, witty, yet grumpy, sarcastic character. Her grumpiness plays a huge role in her humor. But in “About Alex,” Plaza plays a serious career-driven woman who is an aspiring chef. Also, Jason Ritter plays a quiet, shy, but funny, romantic character in “Parenthood.” But in “About Alex,” he plays the suicidal, anxious, depressed, socially-awkward main character, Alex. All in all the movie was full of great laughs and tears.